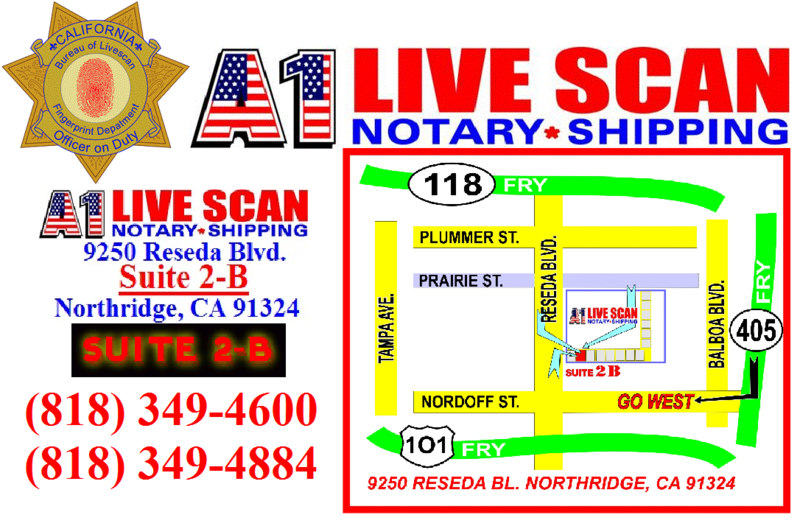 A1 Livescan Notary Shipping is Authorized by Homeland Security and FBI to provide Ink Fingerprinting services to public. Ink Fingerprinting on Ink Fingerprint Card are provided by our certified professionals. Traditional ink fingerprinting is the most common type of fingerprinting. This is the type we use for many of our customers including FINRA Brokerage firms, Security firms,Visa,Immigration, Government employees and many of our other customers. We provide the highest quality ink printing for your ID cards. We provide ink fingerprinting card services to businesses and individual clients. The most common ink fingerprinting card used are standard FBI ink fingerprinting card (FD 258 fingerprint cards). We always have a large supply of ink fingerprinting cards and if you do not already have your own we can supply ink fingerprints cards. If you are not sure what kind of fingerprint card you need feel free to call and we can point you in the right direction. To obtain your criminal history record from another state or another country. Individuals would be required to submit the ink fingerprint card to the appropriate state agency or country’s goverment agency. To obtain a copy of your criminal history record sent directly to you by the FBI. This is particularly helpful for those individuals applying for immigration or adjustment of status. To obtain an out-of-state professional license such as licenses to practice law, nursing and other professions. FINRA / ABA / Federal Employment – Some employers including but not limited to those individuals seeking federal employment and others working in the securities industry regulated by FINRA are required to submit Ink Card fingerprints for background screening prior to being licensed. INK FINGERPRINT CARD FEES $20 – EACH INK FINGERPRINT CARD. 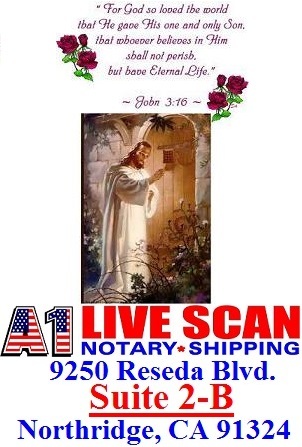 Our company has experienced officers who provide quality on site ink fingerprinting services to our customers or you can come into one of our conveniently located offices in Northridge,California. An FBI Identification Record often referred to as a criminal history record or a rap sheet is a listing of certain information taken from fingerprint submissions retained by the FBI in connection with arrests and, in some instances, federal employment, naturalization, or military service. The process of responding to an Identification Record request is generally known as a criminal background check. If the fingerprints are related to an arrest, the Identification Record includes name of the agency that submitted the fingerprints to the FBI, the date of the arrest, the arrest charge, and the disposition of the arrest, if known to the FBI. All arrest data included in an Identification Record is obtained from fingerprint submissions, disposition reports, and other information submitted by agencies having criminal justice responsibilities. The U.S. Department of Justice Order 556-73 establishes rules and regulations for the subject of an FBI Identification Record to obtain a copy of his or her own record for review. The FBI’s Criminal Justice Information Services (CJIS) Division processes these requests. Only you can request a copy of your own Identification Record. Individuals typically make this request for personal review, to challenge the information on record, to satisfy a requirement for adopting a child in the U.S. or internationally, or to satisfy a requirement to live, work, or travel in a foreign country (i.e., police certificate, letter of good conduct, criminal history background, etc.). If you are requesting a background check for employment or licensing within the U.S., you may be required by state statute or federal law to submit your request through your state identification bureau, the requesting federal agency, or another authorized channeling agency. You should contact the agency requiring the background check or the appropriate state identification bureau (or state police) for the correct procedures to follow for obtaining an FBI fingerprint background check for employment or licensing purposes. Step 1: Complete the Applicant Information Form (pdf). If the request is for a couple, family, etc., all persons must sign the form. Include your complete mailing address. Provide your telephone number and/or e-mail address, if available. Step 2: Obtain a set of your fingerprints. Provide the original fingerprint card. Previously processed cards or copies will not be accepted. Your name and date of birth must be provided on the card. Fingerprints should be placed on a standard fingerprint form (FD-258) commonly used for applicant or law enforcement purposes. Include rolled impressions of all 10 fingerprints and impressions of all 10 fingerprints taken simultaneously (these are sometime referred to as plain or flat impressions). If possible, have your fingerprints taken by a fingerprinting technician. This service may be available at a law enforcement agency. To ensure the most legible prints possible, refer to the Recording Legible Fingerprints brochure. Option 1: Obtain a money order or cashiers check for $18 U.S. dollars made payable to the Treasury of the United States. Please be sure to sign where required. Option 2: Pay by credit card using the Credit Card Payment Form (pdf). Don’t forget to include the expiration date of the credit card that you are using. Important note: Cash, personal checks, or business checks WILL NOT be accepted. Payment must be for the exact amount. If the request is for a couple, family, etc., include $18 for each person. If you are making multiple requests per person, include $18 for each request. Step 4: Review the FBI Identification Record Request Checklist (pdf) to ensure that you have included all the information we require to process your request. Note: Although the FBI employs the most efficient methods for processing these requests, processing times may take up to six weeks depending on the volume of requests received. See the responses to some frequently asked questions.